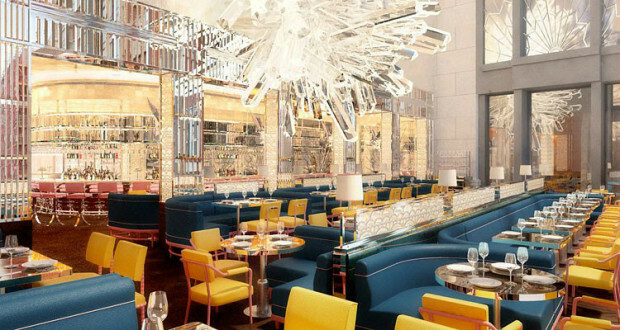 Selfridges is about to get a whole lot swankier as the Brasserie of Light opens this November. The unique new eatery will feature London’s largest artwork by Damien Hirst, an all-day dining menu and British takes on classic cocktails. With an uplifting interior designed by Martin Brudnizki, the bright space sees light flooding the impressive central bar and dining room. One for the 'gram, a 24ft crystal-encrusted Pegasus statue created by Hirst will no doubt be the focal point of the restaurant as it soars over diners with a 30ft wingspan. Headed up by Portuguese chef Emanuel Machado, the menu will feature an eclectic mix of British and fusion dishes, with signature dishes like lobster spaghetti and Pegasus pie served with a yuzu coconut cloud. There's even brunch at the weekend and a Champagne afternoon tea. Reinventing classic cocktails, the menu will include signature sips like a British take on the Kir Royale, swapping cassis and champagne with Bloomsbury Brut NV English sparkling wine, white heron cassis and Plymouth sloe gin.